Even though Peta and Maks revealed last week that they WILL be returning to Season 24 of “Dancing With The Stars”, they are not too fond of the idea of leaving their little guy at home. Baby Shai was born on January 4, and the new parents have been head over heels in love ever since. 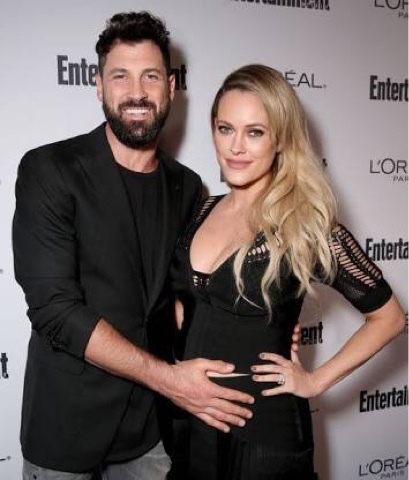 Maks, 37, opened up about how his priorities have shifted since his son's birth: “I'm kind of amazed at how these things quickly change, because we were both career people for so long.” Peta agrees that she didn't expect for it to be so hard to leave her newborn son, but now, she misses his little face every time she closes the door! Sources say that Maks and Peta are super excited to return to the show, and that Peta even has been training every day in their basement. One thing is for sure, that girl sure does look great for having a baby six weeks ago! The gorgeous couple appeared on “Good Morning America” last week to show off their new bundle of joy, and announced that they are ready to get back to the ballroom! They also showed off baby Shai's adorable nursery, which we love! We are so excited to see our favorite couple back on the dance floor in just a few weeks, if they can possibly stand to be away from that adorable baby!